Every other Monday on Make Money Your Way, we will talk about how to make money with real estate. 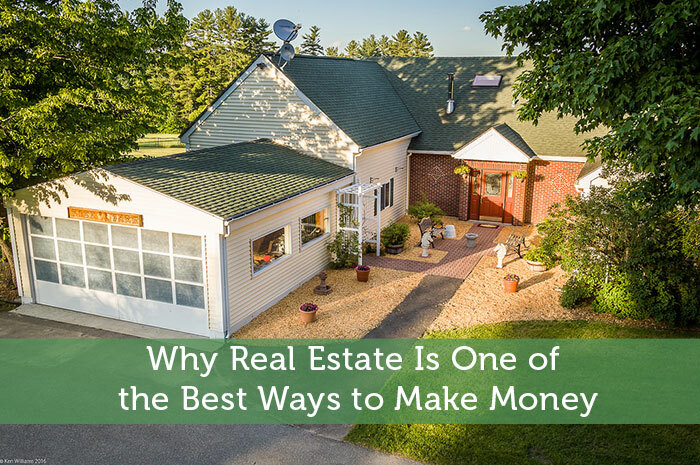 Today as an introduction I want to show you why I think real estate is one of the best ways to make money and build wealth. There Are Many Ways To Turn A Profit With Real Estate. Rental income. That one is the main source of profit investors are going for when buying a rental, and doesn’t need an explanation. Buying low. You turn an instant profit if you manage to buy a property for under market value. Think foreclosures, quick sales, and awesome negotiation skills. Selling high. You can make extra money if you stage the property to attract buyers over market value. With stocks, you always buy and sell at market value. With real estate, you can try to beat the market. Increasing equity. If you take a mortgage to finance a rental, you are increasing your equity with every mortgage payment. I put down 25% on my last rental and with mortgage repayments am around 33% equity at the moment, those 8% of the property value were paid by rents and are increasing my net worth every month. Leverage makes you profit on the full selling price. If that same $100,000 property you bought with $20,000 down sells for $120,000 a few years later, you get your $20,000 plus principal payments back, and a $20,000 profit. It is only a 20% profit over the full value of the property, but thanks to your leverage, you are making a profit of 100%, minus principal payments to the $80,000 mortgage. The bigger the leverage, the greater the return. Tax benefits on interest. Depending on your country of residence, you can often deduce the mortgage interest from the rental income, and create a tax free profit. Profit from a lump sum on a refinance. So you bought your $100,000 place, and put $10,000 worth of improvements, that the tenants paid back with rents. The property is now worth $125,000 because your contractor did a great job, you can refinance to get the $25,000 cash and put 25% down on your next $100,000 rental! How you profit from real estate depends on YOU. When you buy a stock, you never know, for as much as you study the company, if its CEO isn’t about to leave and the next one will run the company to the ground, if there is a merger with a less profitable company in the pipeline, or if an earthquake will destroy the production plant in China. Your real estate investment will be a result of your own efforts to renovate a place, promote it, screen a proper tenant, and keep it up over the years. And real estate is tangible. When all the markets tank, you are trying to hold to your losing positions in hopes they will go up in a few months, or hurrying to sell at a loss before it gets worse. Real estate will bring you a monthly rent to cover the mortgage, even if you have negative equity. And in periods of economic turmoil, when people lose their houses to foreclosure or first time buyers are denied mortgages by the banks, you will have more potential renters than ever. When things go back to normal, home prices will increase and you can make a nice exit, sit it out until the next crisis, and go back in the game to buy low. Don’t want to time the market? Just buy. Now is as good a time as any, for all the reasons mentioned above. What Are Your Thoughts About Real Estate? I adore real estate and believe that everyone should learn the ropes by managing it themselves first – and take the time to learn landlord-tenant law inside out. Because that’s the only way you’ll truly know whether or not the property manager you hire some day is doing a good job. Also, I think the key to lower risk real estate investing is to invest in solid neighbourhoods, and go into it assuming you’ll keep the property over the long term (as opposed to buying with the intention of flipping it in a year).